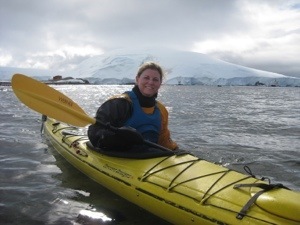 The conditions favored kayaking this morning, so we prepared to put in for our first kayak of the trip. It took us twenty minutes to get into all our gear, and fully dressed in long underwear, ski pants, a sweater, fleece, dri suit, kayak skirts, booties, gloves, hat and life vests. We looked like astronauts. 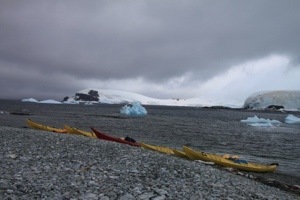 We disembarked into the zodiac which carried us and pulled the kayaks to the area where we would launch our paddle. We loaded into the kayaks off D’Hainaut Island located in Mikkelsen Harbor which indents the larger Trinity Island of the Palmer Archipelago. I was the first passenger in my craft because my kayak named “Gull” was the first in the line. 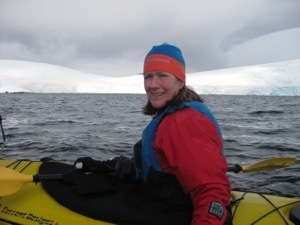 I carefully placed the “whale food”, a thin blue pad that can blow away for the whales to eat, on my seat, climbed over the side of the zodiac, and stepped into the kayak, placing my feet on the foot pegs and stretching the skirt over the open area with the guides’ help. Fellow paddlers handed me my paddle and strapped my dry bag into place. 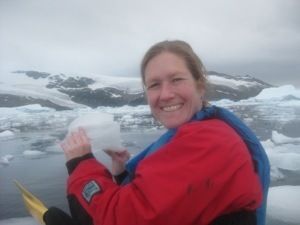 I was on the water with Val, who is always the first on and last off to help with the loading and unloading procedure. The conditions were calm while I waited for my fellow paddlers to join me. 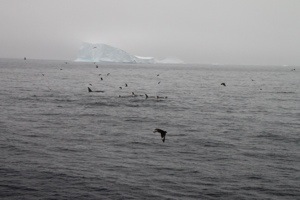 However, the conditions quickly changed, as soon as we turned toward the island shore. A katabatic wind which is high density, cold air that blows downward from gravity off glaciers or ice sheets blew with FORCE right into our face! Nicole and I had decided on single kayaks instead of a double in case we both didn’t want to go each time, and I was beginning to lament my decision. My arms and shoulders were burning and resting for a moment only meant I would be going backwards…Not an option! In addition, I was not used to a kayak with foot pegs for the rudder, thus I was highly inefficient, weaving toward our destination versus following a straight line, causing me to be slow and bring up the back of the pack. Despite the freezing cold wind, I was boiling hot from exertion. With sweat blanketing my core, I wanted to peel off two layers off clothes…also, not an option. What had I gotten myself into?!? Thankfully, when we made it to the cover of the shoreline, and we got a break from the wind. We didn’t, however, have a break from the waves. We had our first casualty as one of the kayakers took an unexpected polar plunge. Val and the Zodiac driver Dave were quick to his rescue, though it was shallow enough for him to stand up. 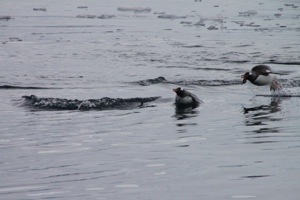 Needless to say, he was much cooler than I was, especially since he missed zipping the last centimeter of his dry suit. 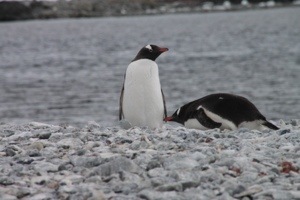 Once Tim was situated in the zodiac, we kayaked along the shoreline while watching the gentoo penguins splash nearby. 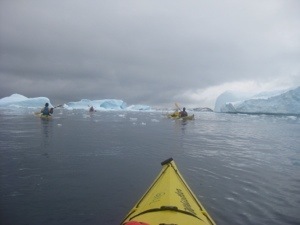 Then we opted for another open water paddle through some icebergs and past some ice cliffs dotted with dark blue ice markings to our own private island – different from where the rest of the passengers were dropped on land. We paddled perpendicular to the shore to beach our kayak and then explored the island. 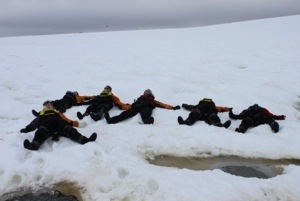 Weddell seals relaxed all around, even while we made snow angels. 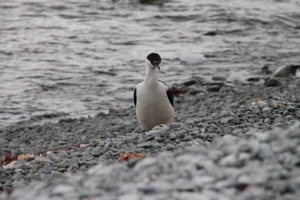 While penguins honked by the shoreline, a cormorant swooped in and a Weddell seal swam around our kayaks and then galumphed its way up on the rocky bank. 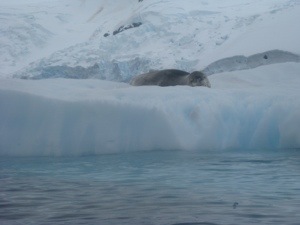 It didn’t take long for our body temperatures to cool as we walked amongst the scattered whale bones and wildlife, so we all launched our kayaks and paddled back toward the boat, though we don’t load or unload near the ship because it is too dangerous. We always use a zodiac. The safety zodiac that follows us while we paddle picks us up, and we leave the kayaks behind in the water for other zodiacs to retrieve. They load them crosswise on top of the zodiacs, and the crane on the stern of the ship lifts the zodiacs and the kayaks up to the third and fourth decks respectively. On our way to Cierva Cove, our afternoon stop, our ship was visited by some Fin whales, and this time, at least close enough for a photo. I was elated because despite my travels, I had never seen a whale. Little did I know, the fun had just begun. 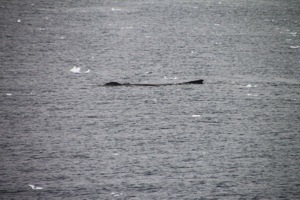 It was a whale haven in Cierva Cove, only Minkes and a humpback were in the area. 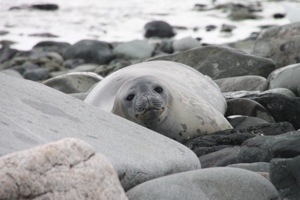 As we unloaded into our kayaks, in absolutely placid waters, reports of a humpback sleeping at a distance were already being passed along the walkie talkies among the zodiac drivers. We could see it from afar, but by the time we were ready to paddle nearby, it took to swimming in the deep waters. It was weird to be in a cove so close to shore, yet be in waters deep enough for whales! 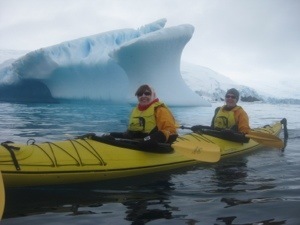 While the other passengers took zodiac trips around the cove, we paddled by amazing icebergs – all shapes, sizes, and colors. 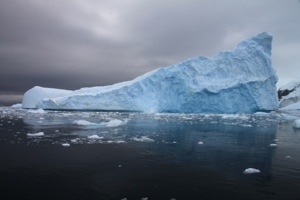 We were allowed to touch any iceberg less than three feet high, otherwise we needed to stay twice its height away from it as it could roll or ice could calve and create sudden waves dangerous for kayakers. 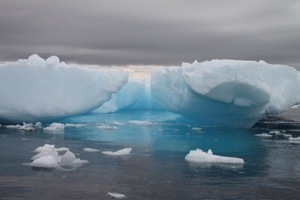 The harbor was filled with what is known as brash ice…small fragments of floating sea ice everywhere. 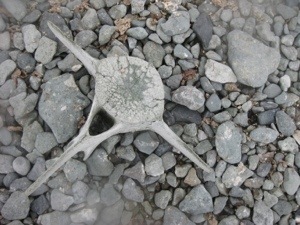 Some was as small as ice cubes that we could eat, others were big blocks. As I mentioned earlier, the water was so placid, we could see our reflection, which made for an easy paddle, even as we rammed through the ice. Thank goodness, as we were whipped from this morning! 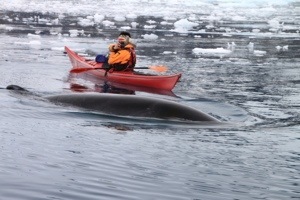 A few Minke whales glided by as we paddled around the ice hunting for wildlife. 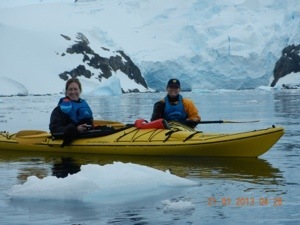 We spotted a leopard seal resting on an ice floe, penguins, and even a giant red jelly fish, but the last twenty minutes of our absolutely fabulous two hour paddle was when all the fun really began. I had just gotten into the zodiac as I wanted to take some pictures with my DSLR that I was too afraid to bring along with me in the kayak, when the Minkes started playing with us. The Minke’s are smaller, faster whales with a tougher skin so they don’t mind repeatedly surfacing in the brash ice. 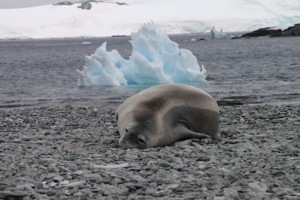 A pod of them surrounded our kayak group and support zodiac. They would surface and blow, surface and blow…leaving me spinning in a circle trying to guess where the next photo opportunity would be. To my surprise, one left the perimeter and surfaced between the zodiac and Val’s kayak. It was about three feet away and totally rocked her craft. 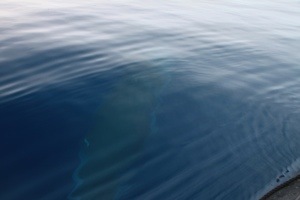 Then, the Minke submerged right beneath our zodiac. 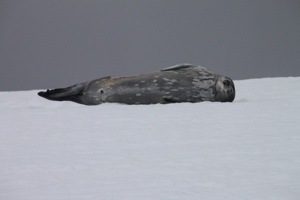 WOWs harmonized with the snort of whale blows in the otherwise silent cove. Even our guides were exploding with excitement…that’s how jaw dropping the experience was as we waited and watched in surprise and awe. 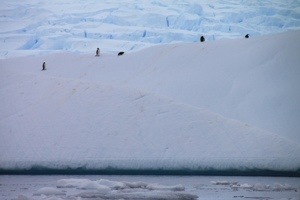 They must have known when it was time for us to return to the ship; however, as they began swimming away from the cove, ending the spectacle, though the porpoising penguins tried to help out with the finale! The whale frenzy didn’t stop, later this evening there were five to six Orcas (Killer whales) feeding at a distance off the bow of our boat. One was a calf! Orcas generally feed on seals, and we are told one of the easiest way to spot whales is to look for sea birds who are trying to get in on the action. Action it was! A tremendous day! OMG Beth!! This was fascinating and very exciting. Thrilling!!!! A tremendous day indeed! What an amazing experience with all the wildlife. 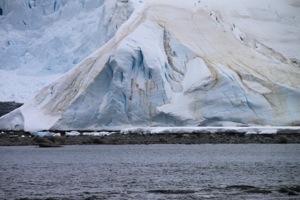 I really loved the ice – had no idea it could come is so many colors. 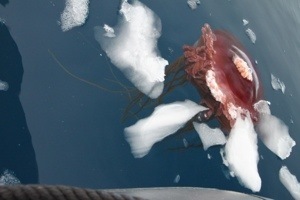 And the red jelly fish! What an experience! Thank you! Wow! What a great day! Loved all the pics, you are one lucky lady! It’s Connie in Louisville, KY. You stayed with us during some snow & very cold temps, hope you remember. I’m really enjoying your post. You lead such an exciting life & so adventitious. I’m having a great time seeing things and enjoying all the information because I know I will never see this. You are going to have to write a book. Look forward to reading the rest of your post (I save them up for about a week & then read them). I’m going to start forwarding them to my sister so she can enjoy your adventures also. I’m so glad you contacted me. I tried emailing you a while back (it’s been maybe a year now), but I think my email may have gone to spam! I wanted to get your mailing address. I often think of you and how you are doing. I’m so glad I didn’t have to sleep in the bitter cold. I will try emailing again. I think I still have address.